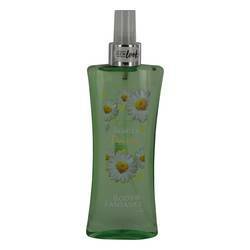 Body Fantasies Signature Hearts & Daisies Perfume by Parfum De Coeur, Like summer in a bottle, Body Fantasies Signature Hearts & Daisies by Parfum De Coeur is a fun-loving, sunny body spray that can be worn anytime of the year. Youth and freshness abound in this fragrance that opens with crisp apple, sweet melon and enticing pear. A bouquet of florals sneak in as hints of pink peony and lily of the valley bloom. These notes create a flirty scent that welcomes base notes of vanilla and creamy Read More Read More woods for a radiance sure to conjure summertime memories. Parfum De Coeur, renamed PDC Brands in 2015, has been in the beauty business since 1981. It offers an array of fragrances, body washes and lotions for both men and women in the U.S. and internationally. The company, which has headquarters in Stamford, Conn., unveiled its line of Body Fantasies body sprays in the 2000s. These sprays are sold in 8-ounce bottles. Each scent has its own unique color. All products are original, authentic name brands. We do not sell knockoffs or imitations.